Lepenski Vir is a site located among the Iron Gates, a 100km-long series of gorges where the Danube River runs between the Carpathian mountains to the north, and the Dinaric Alps to the south, where the only known domesticate was the dog. The teeming fish in the Danube allowed sedentary communities to develop along the Iron Gates, with group sizes near a hundred or more. Settlements in the Iron Gates, such as Lepenski Vir built trapezoidal houses with floors levelled by crushed lime mortar. Food refuse such as the bones of deer, cattle, pig, chamois, birds, molluscs, several species of river fish, and the migratory sturgeon indicate multi-seasonal occupation. A unique find at Lepenski Vir was a series of sculptured boulders which depicted fish or human-fish hybrids, which have been interpreted as evidence of belief systems. 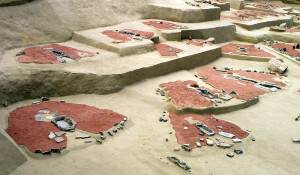 There are a number of burials, some with little formality in and around structures, and some with special burial zones around open-air hearths, suggesting the village was divided into well-defined social groups. The Iron Gates fishing villages are variously known as Mesolithic foragers that resisted the “wave of advance” of incoming farmers at one side, and centers of indigenous Mesolithic domestication at the other.